Briciole is the real deal. Not only are the people who work there Italian, but the people who eat there are also largely Italian. This is a very good sign. The dishes jump off the menu, just begging to be ordered. And as they do a great selection of small plates, you can order quite a few without the slightest hint of guilt. The star dish for me was surprising, not only because I was surprised to learn that it was truly Italian (it dates back to 1834 apparently), but I was also surprised how incredibly delicious it was. 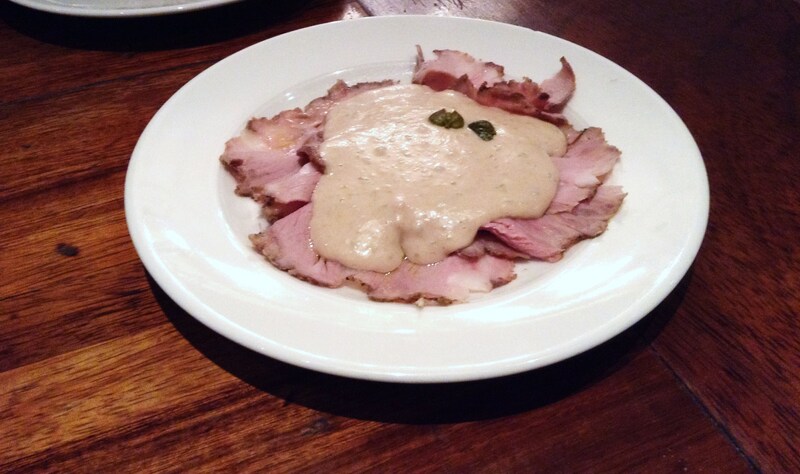 It was vitello tonnato: veal in tuna sauce. There are three things about this dish that could be potential turn offs: 1 it’s veal; 2 the color and general appearance of the tuna sauce is slightly questionable; and 3 some Italian has made fish into a sauce and put it on top of some meat. But believe me, this dish was a triumph. The tuna was creamy, but balanced by capers and anchovies. It was the perfect combination of salty, sharp and creamy and went so well with the perfectly roasted, paper thin slices of veal. I know the mention of veal will have some of you hovering the mouse over the red X straight away, but the UK produces rose veal which is reared for 6-12 months (similar to lamb and pork) and slaughtered according to RSPCA Freedom Food guidelines. Veal is a result of our demand for milk. So if you drink milk and eat butter and cheese, then not eating veal (when humanely reared as it is in the UK) is a bit short sighted (read more about British rose veal here). 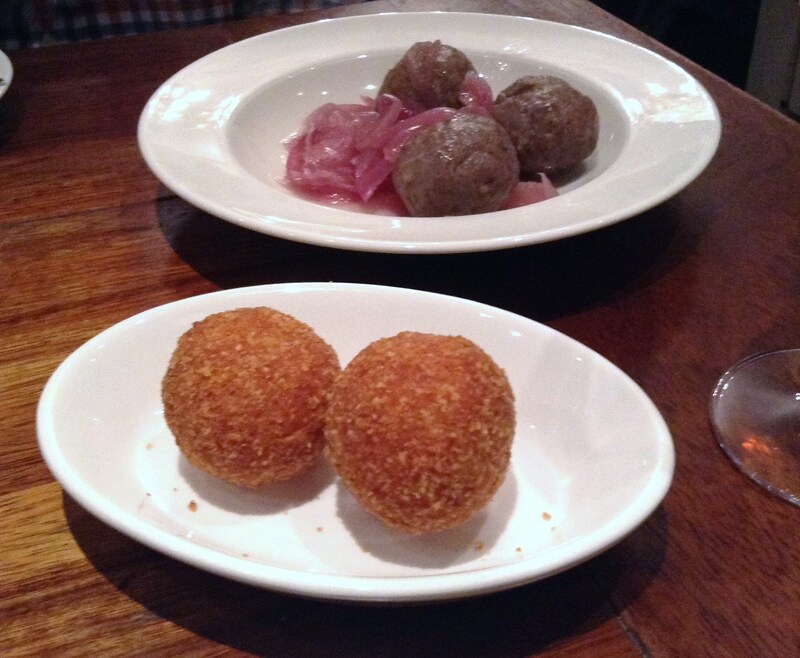 We couldn’t ignore the arancini because deep fried balls of creamy risotto are always a good idea and the meatballs were beautifully pink in the center and served with sweet and sour onions. 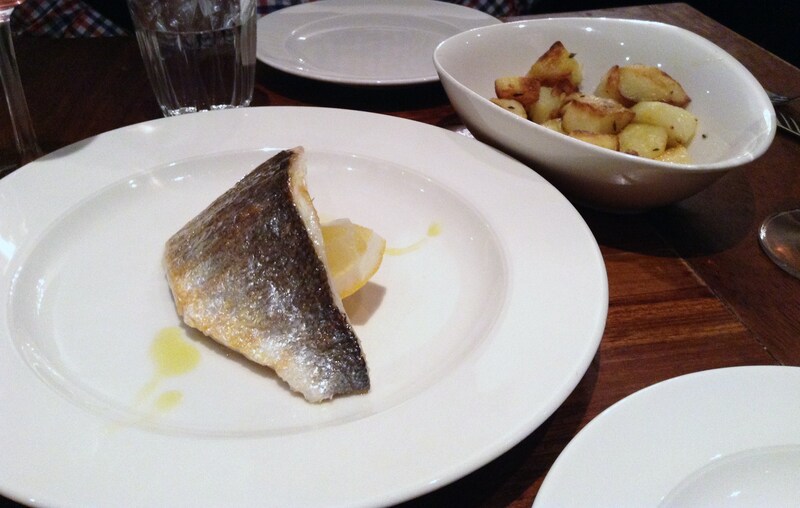 We decided to try the sea bass too, it was cooked to perfection, and the rosemary potatoes were about as good as they can get. For the neighborhood Briciole is in, the prices are very reasonable and overall it’s really good value for money. 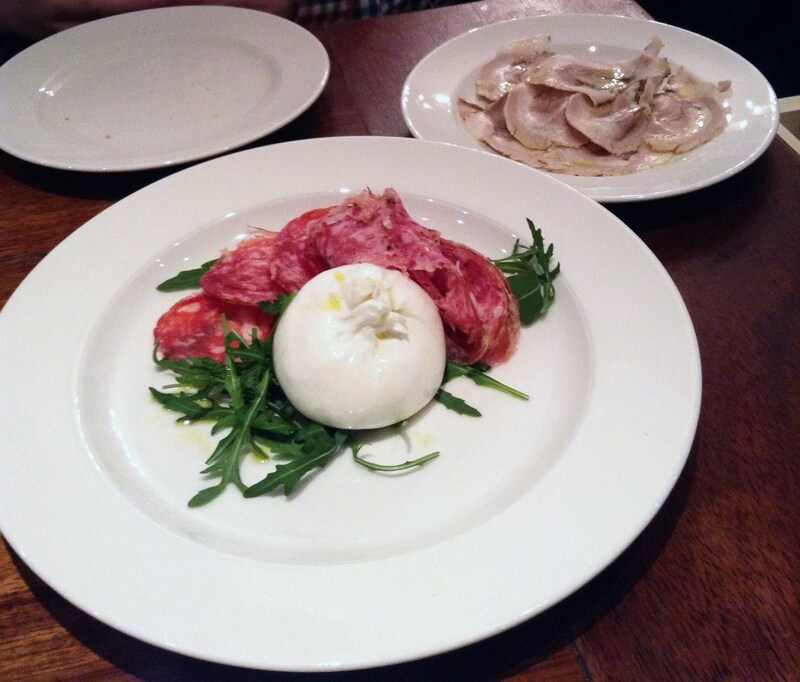 Even if you just want to go and enjoy some fine imported Italian charcuterie and cheese, it’s worth stopping by. From the outset I could tell that this was Italian food as it was meant to be: it was simple, delicate and completely focused on the quality of the ingredients. There were no 21st century cooking techniques used to try and make a tomato taste like salami; a tomato was a tomato, and salami was salami (or salumi, actually), and both were completely delicious. You have a knack for finding interesting, a little out of the way restaurants. Arancini are among my all-time favorites.